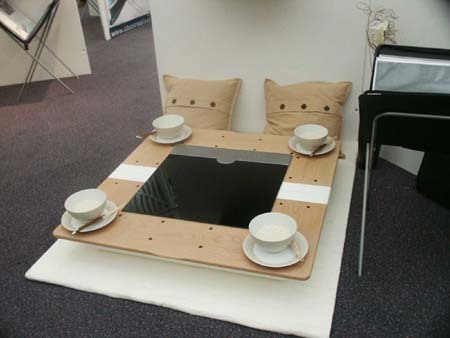 New Designers, an annual exhibition showcasing student creative talents from all over the country, held its 19th show last month at Business Design Centre, in Islington, North London. Over 4,000 students from 200 universities and colleges took part. 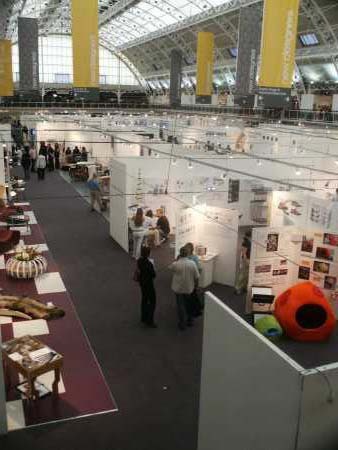 Part 1 (1st – 4th July) showed designs in Fashion, Textile and Accessory Design while Part 2 (8th – 11th July) featured Furniture, Graphic, Interior and Architecture Designs. ‘Outdoor Teppanyaki’ by Andrew P Murphy is designed so that it can be placed directly on the ground, and diners sit around it to eat. It is made more practical by being able to fold it in two down the middle, and thereby facilitating mobility. 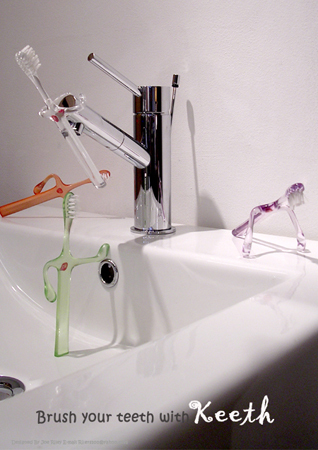 Ever wondered how to keep your toothbrushes clean and make them more fun to use? Joe Riley of University of Plymouth came up with ‘Keeth’, a range of four different human posed toothbrushes in four different colours. They provide fun into the boring task of brushing teeth as well as being a practical and hygienic design for every member of the family. Ulrika Jarl designs lights and tableware using simple but impressive designs. 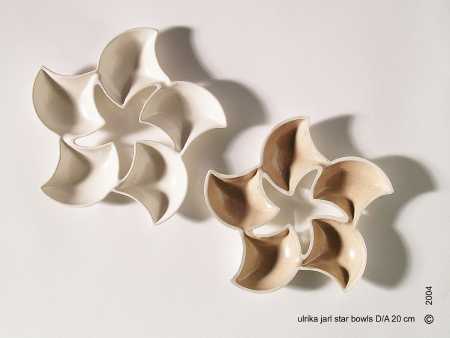 The pictured star bowl is semi porcelain, and is slip cast in plaster moulds. ‘One Year On’ is a satellite exhibition held in the upper floor of the exhibition center. It is a scheme backed by the Crafts Council to showcase works by designers who are within one year of graduating or being in business. 60 designers altogether took part. The work could be commissioned or bought on the spot. 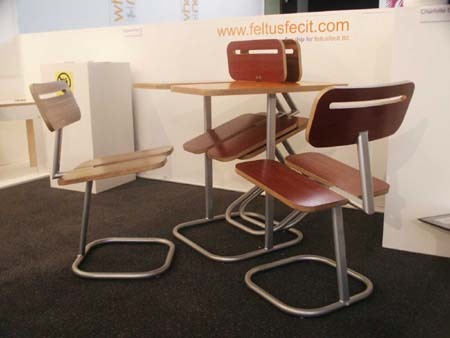 Tobius Feltlus‘ unique stacking tables and chairs were inspired by a stint at waiting on tables during his student days. He found that he could not stand sweeping around the legs of the chairs and tables, so he came up with a design where the chairs were slotted in to the split-top table and enabling the chair legs to lift from the ground, making it easier to clean! The participants of ‘One Year On’ seemed a little more sophisticated than the student designers in the main exhibition, as they had acquired a sense of business, and were more spontaneous to catch the attention of the press. Walking away from the show, it was intriguing to wonder just how this year’s graduates would turn their designs into lucrative business deals in a year’s time.